You bought access? Login to your account and get access to the page. Read the complete exemplary SWOT TOWS analysis of the hair salon Aphrodite which includes the description of the company, the evaluation of the factors, the detection of the relations, the evaluation of every strategy variant and the description of the strategy of the further procedures. If you want to see the process of the SWOT TOWS analysis creation, you can check it for free on the JakNapisac.com in the article SWOT/ TOWS strategic analysis – step by step. Choice of strategy. The example of the SWOT TOWS analysis was created based on the guidelines included there. 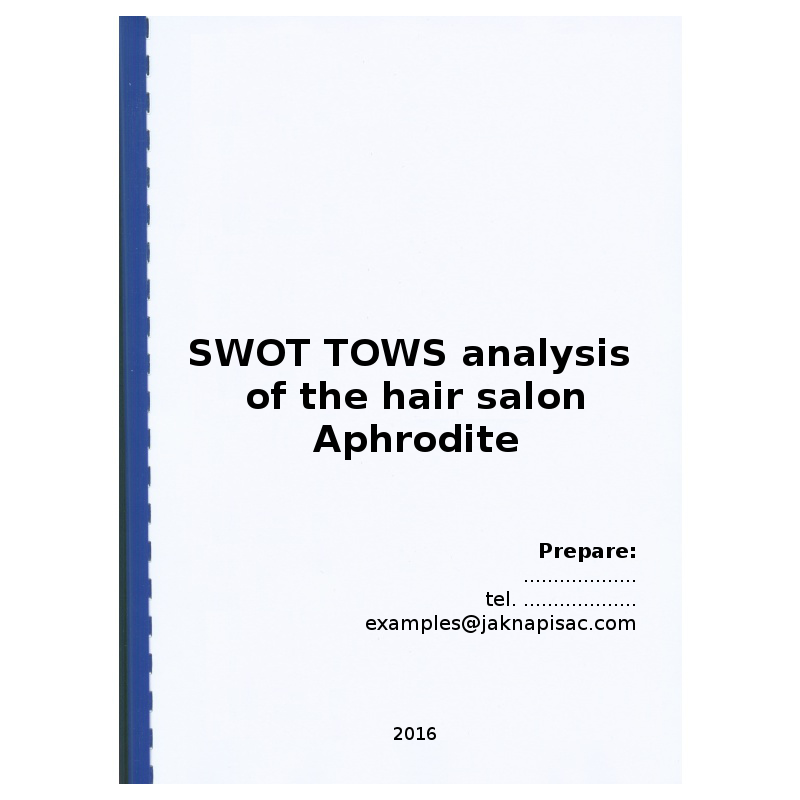 Read the SWOT TOWS analysis prepared for the hair salon Aphrodite. The analysis is not only a table divided into four parts in which the random factors were usually written. It is a tool thanks to which you can choose a strategy for your company based on the actual strengths and weaknesses as well as the opportunities and threats present in its environment. The SWOT TOWS analysis was made for the newly established hair salon Aphrodite which began its activity in 2016. The concept of the research used was to determine the strengths and weaknesses of the company, point the opportunities and threats in its environment, and then to set a strategy of the further procedures for it. The subjects of the analysis were the current situation and the forecast for the future. A point of reference, hypothetically, is a perfect company for which we conducted a comparative analysis determining the strengths and weaknesses of the managed company and defined the opportunities and threats which appear in the sector. The results of the SWOT TOWS analysis will help the owners to take strategic decisions concerning the development of their company. It is a fragment of the text. Buy a 21-day access to the whole content. Use it to write your own document. The full text has 23 763 marks. The full copyright of the text belongs to JakNapisac.com. All rights reserved. Any reproduction, publication, further distribution or public exhibition of the articles, in whole or in part, is strictly prohibited without prior written permission of the copyright holder.